This sink is gorgeous. It's brighter, more velvety and more pristine than I expected! The matte stone is such a modern take on the vessel sink and the proportions are just right. It will go perfectly with the tile, matte black wall faucet and cabinet in our new bathroom. I can't wait to use it! Seamless, solid core PMMA construction makes the VIGO Magnolia Matte Stone Vessel Bathroom Sink extremely durable. Its surface is scratch and fade resistant, and is easy to keep clean with the included buffing circle. 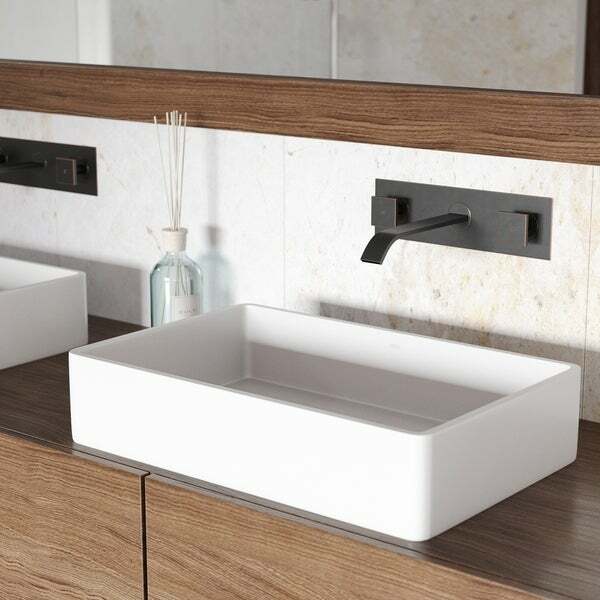 With a rectangular design and satiny smooth Matte Stone surface, this vessel sink makes a clean, contemporary statement in any bathroom. Dimensions 21.25 In. X 13.88 In. X 4.75 In. This sink is beautiful! The color and finish look high end and the height of the vessel is perfect— high enough to impede splashing but not too high that faucet options are limited. Will add picture once installed! "Hi does this sink have an overflow?"